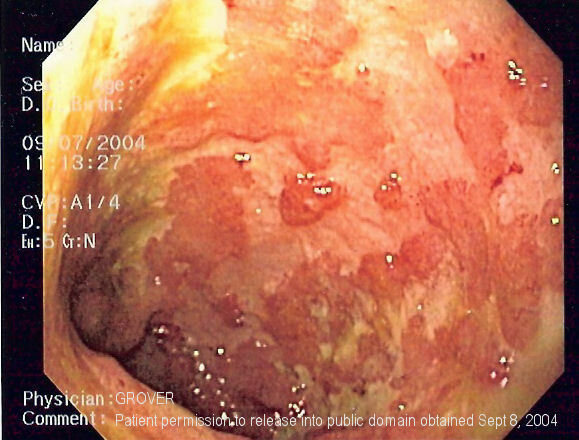 A case of ulcerative colitis, a form of inflammatory bowel disease. Photo via Wikimedia Commons. Credit: Samir. A two-hit punch in the gut might explain why some people find themselves alone among their closest relatives in having inflammatory bowel disease (IBD). The double gut punches come in the form of a compromised intestinal wall coupled with a poorly behaved immune system, say Emory researchers, whose work using mice was published in the journal Immunity. IBDs include ulcerative colitis and Crohn’s disease, the latter of which is slightly more common in women. An inflamed gut is the key feature of IBD, which affects about 600,000 people in the United States each year. Typical symptoms include bloody diarrhea, fever, and cramps, which can come and go with bouts of severe inflammation punctuating relatively calm periods. The going explanation for these disorders is a wonky immune system, but some breach of the barrier that keeps your gut contents in their place is also implicated. Researchers also have identified a link between bouts of gastroenteritis--known around my house as “throw-up” illnesses--and development of IBD. What’s remained unclear is how people who have these so-called “leaky guts” don’t develop a disease like Crohn’s when a close family member with a leaky gut does. These hints in humans led the Emory investigators to examine the interaction of a compromised gut and the immune system in mice. The mice in the study had ‘leaky’ gut walls because they lacked a protein that usually ties cells together into water-tight sheets. Without these proteins sealing up the intestinal lining, bacteria and other components can make their way their deeper into the intestinal wall, triggering chronic inflammation. The thing is, these mice with their leaky guts don’t develop colitis spontaneously, a situation, the investigators hypothesized, that reflects families full of people with leaky guts but rarely IBD. Permeable intestines alone aren’t enough. Some other dysfunction related to the immune system, they figured, must pile onto that leakiness and bring on the inflammatory disorder. If you’re an immunologist--which I am not--an obvious choice for investigation is a class of immune cells called T cells. These cells come in a dizzying array of types, but one way to narrow them down relies on a protein that some but not all of them make. Pulling out the T cells that make this protein, says Timothy Denning, PhD, a mucosal immunologist at Emory and study author, is “the simplest way” to start examining the immune system involvement because these cells play a ton of roles in balancing different immune responses. So, they first collected the T cells carrying this protein from the mouse intestines. One of the things T cells do with TGF-beta is to talk to B cells, another class of immune cell. B cells take responsibility for remembering what’s attacked you in the past and marshaling forces if it attacks again. Also, when B cells are stimulated, explains Parkos, one way they respond is to release proteins--antibodies--that target the offending invaders. In the gut, the kind of antibody the B cells make in response to the TGF-beta message is immunoglobulin A, or IgA. This antibody “keeps bacteria in check,” says Denning, and also probably “broadly neutralizes lots of different microorganisms” in the intestines, adds Parkos. The Emory-based team found that when the leaky-gut mice also had an IgA deficiency, they became more open to the types of immune cells that cause gut inflammation. The animals also were far more susceptible to colitis triggered by a chemical treatment in the lab and had much worse disease. Without the IgA, the mice couldn’t dampen inflammation triggered by bacteria slipping through the intestinal breaches. The results of this two-step physiological fail, in mice, at least: severe inflammatory gut disease. Some research groups are conducting trials to treat IBDs with helminth worms--intestinal parasites--on the hypothesis that their presence would induce a balance in the immune system and tamp down an overactive inflammatory response. The balance in this case is supposed to be between two competing aspects of the immune system, called Th1 and Th2. But one issue in these intestinal inflammatory disorders, says Denning, is that Crohn’s is linked to Th1 hyperactivity while ulcerative colitis is associated with Th2. Yet the worms appear to show some beneficial effects in both disorders, in spite of the different involvement of Th1 and Th2. The TGF-beta signaling effect on IgA that the Emory group identified operates by a third component, tentatively identified as Th3. Both Denning and Parkos are intrigued by the possibility that the presence of helminths might trigger this pathway, rather than influencing Th1 or Th2, explaining why worm treatment has sometimes proved useful for both Crohn’s and ulcerative colitis. As for why IBD arises, the researchers hope their findings answer some questions. “There are different camps in the IBD community,” says Parkos. “Some say immune system, some say barrier, others say genetics or environment.” What they have with their results, he says, is evidence showing that a leak alone is not enough and that a wonky immune system alone is not enough. But the double-whammy of a leaky gut and an absence of immune protection “dramatically increase susceptibility to disease, and that helps explain why diseases are so complicated,” he says.